Safety and security are important things when working in your garage, and we kept that in mind when we built the best jack stands in the market. 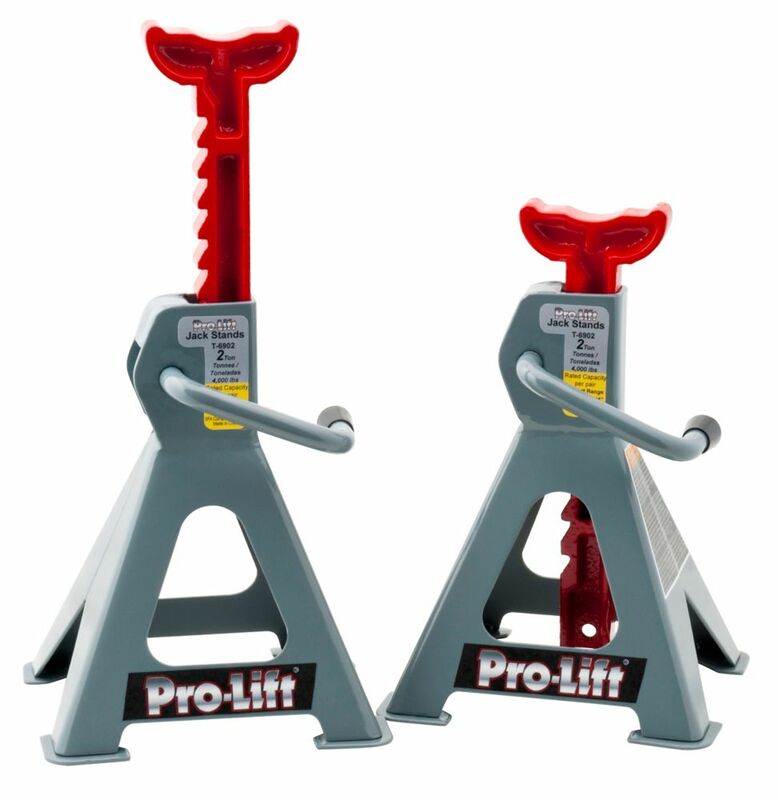 Never lift your vehicle without immediately securing them with Pro-Lift jack stands. Comes in a pair. Support Range: 10" - 16¼"
F-2533 Pro-Lift 2-1/2 Ton Suv 21" Speedy Lift Hydraulic Floor Jack with E-Z Lift Technology. E-Z Lift Technology eliminates the endless pumping of conventional jacks to get your jack under load. With just one stroke, E-Z Lift lets you immediately lift under load, saving you time and energy. Pro-Lift hydraulic service jacks are designed to meet ASME / PALD requirements. Built in by-pass system protects against ram over travel. Heavy duty steel construction ensures long term durability. Swivel saddle and swivel rear casters provide for easy positioning. Carry handle for convenient transportation. 2 Ton Jack Stand (Pair) Safety and security are important things when working in your garage, and we kept that in mind when we built the best jack stands in the market. Never lift your vehicle without immediately securing them with Pro-Lift jack stands. Comes in a pair. 2 Ton Jack Stand (Pair) is rated 4.5 out of 5 by 6. Rated 4 out of 5 by Waji from Good for an average use Simple to use, Packaging is a bit complicated, one for the stand red bar is loose while the other is tight, not sure if it specific to the one I got or unique across all items. Overall its good for simple jobs like oil change. Rated 5 out of 5 by Ironman1953 from Great jack stands. Can’t beat the price. ... Great jack stands. Can’t beat the price. Rated 4 out of 5 by Bbdan10 from Great product I bought this to do the brakes of my Yaris and I'm satisfied with the product is high quality, it is well painted, work as advertised and at a very reasonable price. The only reason I don't give 5 stars is because I wish they could take more weight as much of the stands out there do. Rated 4 out of 5 by Peter in Pickering from 2-Ton Jack Stands They come in a pair. Beware that the strength of each is only 1 ton! Only 2 tons when using 2 jacks stands at the same time. Be careful. I assume there is a little safety factor built into the construction. They look nice. They function as expected. The shipment was prompt. Note: there is a metal tab to be bent inward to keep the upper support from lifting out of the base. Use both at the same time with the shared support of both stands.